Question: What is involved in a hair transplant, and how long does it last? How does this differ from hair plugs? I’m only 34 but have lost a lot of hair already and have tried hair-growth shampoo without much luck. 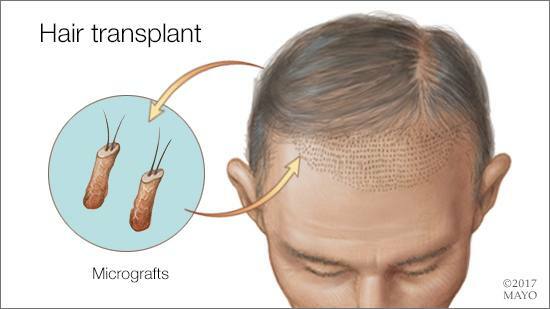 ANSWER: A hair transplant is a form of skin graft that rearranges the hair you have by taking hair and skin from one area of your head and moving it to another. It’s an effective, permanent treatment for hair loss. A hair transplant involves significant cost and recovery time. In most cases, it requires multiple procedures over time to get the best results. Therefore, hair transplants generally are used only when other hair-loss treatments have not worked. The concept of transplanting hair dates back to the 1950s, when it was discovered that sections of hair and skin could be moved from the back or sides of the scalp — areas typically unaffected by age-related hair loss — to bald sections of the scalp. The hair in the transplanted areas would continue to grow as it did before it was moved. A hair transplant technique used for many years involved relocating skin grafts with 10 to 15 hairs per graft — about the size and shape of a pencil eraser. Small spaces were left between each clump of hair. The look of these transplants gave rise to the term hair plugs. That technique is no longer commonly used. Instead, hair is transplanted via micrografts, in which only one or two hairs are included in each graft. This achieves a more natural look. As you decide whether to pursue a hair transplant, there are several factors to consider. First, consider the hair-loss genetics in your family. Picture how your male relatives on both sides of your family look (or looked) in their 50s and 60s. If you see commonalities in how they have lost their hair, it can give you a good idea of how your hair loss may progress. That’s important, because hair transplants don’t change your genetics. Because you’re only in your 30s, it’s likely your hair loss will continue for some time. That means if you get a hair transplant now to cover the bald areas, you may need additional transplants to cover the areas where you continue to lose hair. Otherwise, you’ll end up with bald patches between the transplanted areas and the areas where your natural hair remains. Second, think about recovery time. When hair is transplanted, it looks the same for about a month. Then, it falls out. After that, it takes three to five months before the transplanted hair begins to grow again. It takes additional time beyond that for the hair to get to an appropriate length to be able to style. That means you won’t see the best results from a hair transplant until about eight to 12 months after the procedure. Third, hair transplants can be expensive. The cost may be $10,000 or more per procedure. Because it’s considered a cosmetic surgery when used for age-related hair loss, hair transplants typically are not covered by medical insurance. With these considerations in mind, it’s usually recommended that you try other hair-loss treatments, such as the over-the-counter minoxidil lotion, before you undergo a hair transplant. If nonprescription options aren’t effective, talk to your health care provider about the prescription medication finasteride. It’s taken daily as a pill. Many men taking finasteride experience a slowing of hair loss, and some show some new hair growth.